France's Jo-Wilfried Tsonga celebrates during his Davis Cup match against Serbia's Dusan Lajovic. Yannick Noah’s hosts went into the day needing just one victory from the final two singles rubbers to take an unassailable 3-1 lead against an understrength Serbia, who were missing Novak Djokovic, Janko Tipsarevic and Viktor Troicki. But the former Australian Open runner-up took the fourth set by a double break as Lajovic’s resistance was broken. France are into their fourth Davis Cup final since the last time they won the trophy in 2001, and first since losing to Roger Federer’s Switzerland in 2014. They will face either Belgium or Australia in the final, with Lleyton Hewitt’s visitors leading 2-1 in Brussels. 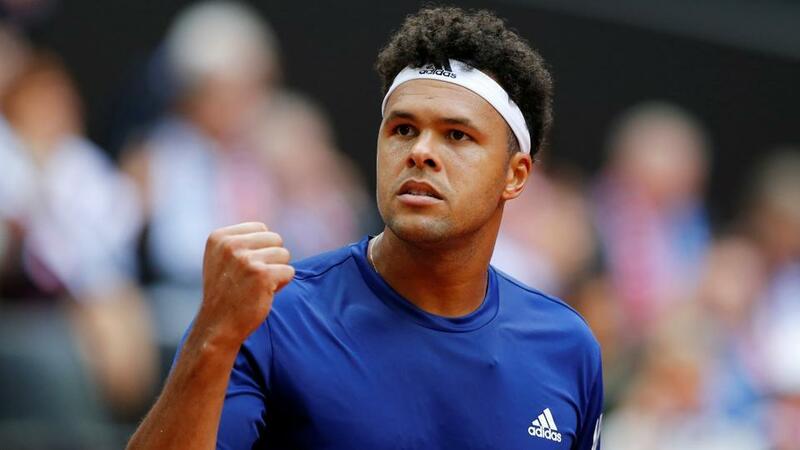 Jo-Wilfried Tsonga fought back from a set down against Dusan Lajovic to book France a place in the Davis Cup final with a semi-final win over Serbia in Lille on Sunday. Yannick Noah’s hosts went into the day needing just one victory from the final two singles rubbers to take an unassailable 3-1 lead against an understrength Serbia, who were missing Novak Djokovic, Janko Tipsarevic and Viktor Troicki.